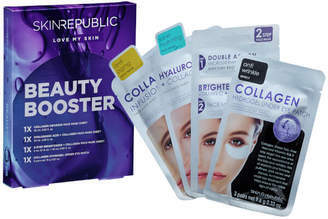 Create a radiant and glowing complexion with the Skin Republic Beauty Booster Gift Set , a collection of three brightening, balancing and anti-ageing face masks, as well as an extra mask for free! Enriched with deeply nourishing ingredients, the sheet masks work to reveal a luminous and healthy-looking visage. The Set Contains: Collagen Infusion Face Mask Sheet (25ml) Combining Collagen with Elastin and Vitamin E, the mask performs a firming and toning effect on skin whilst intensely boosting moisture to reveal a more youthful look; fine lines and wrinkles are smoothed and elasticity and strength is enhanced. Rich in vitamins and antioxidants, the mask helps fight free radical damage and slows down signs of ageing. Its dose of Wheat Amino Acids encourages the growth of new tissue to promote healing and rejuvenation. Hyaluronic Acid + Collagen Face Mask Sheet (25ml) Utilising the Transdermal Delivery System to ensure efficient absorption of beneficial ingredients, the luxurious face mask has been expertly formulated with plant extracts and minerals to help reduce visible signs of ageing. Hyaluronic Acid offers long lasting hydration and helps stimulate natural collagen levels for lifted and revitalised skin. Delivering nutrients and intense moisture with close and continuous contact, the 20-minute treatment minimises the look of fine lines and wrinkles, unveiling a radiant and healthy-looking complexion. 2-Step Brightening + Collagen Face Mask Sheet (3ml/25ml) The first step of the treatment comprises an exfoliating skin peel that uses pure Brown Sugar to lift away dry, dead skin cells and improve absorption of the second step. The nourishing face mask is infused with a serum containing Vitamin C and Collagen, which reduce the appearance of dark spots and discolouration and promote a plumper, firmer skin texture. After the two-step treatment, skin will appear brighter, smoother and enviably youthful. Collagen Hydrogel Under Eye Patch (3 Pairs) Delivering nutrients and intense moisture with close and continuous contact, the treatment is dedicated to rejuvenating and hydrating the delicate skin around the sensitive eye area. Targeting five signs of ageing around the eyes, including fine lines and wrinkles, loss of elasticity, puffiness, dark circles and dryness, the serum-infused eye patches combine Collagen with Green Tea, Aloe Vera and a host of vitamins to smooth the appearance of wrinkles, combat fatigue and intensely nourish.